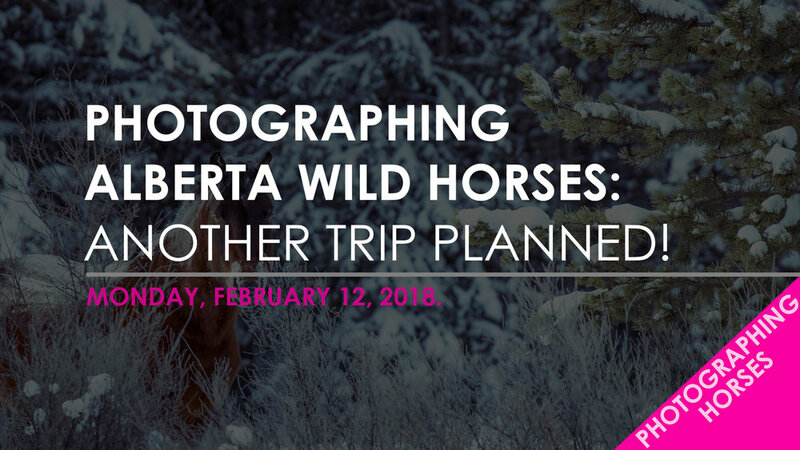 Another Round of Photographing Alberta Wild Horses Has Been Planned! I know that the 10 days to reveal my most asked questions from my "Ask Me Anything" Challenge is not up yet. But there is one that I would like to reveal early and that is simply because I am getting asked this a lot and it's obviously something that many want to see happen. "ð�—ªð�—µð�—²ð�—» ð�—®ð�—º ð�—œ ð�—´ð�—¼ð�—¶ð�—»ð�—´ ð�˜�ð�—¼ ð�—¯ð�—² ð�—½ð�—µð�—¼ð�˜�ð�—¼ð�—´ð�—¿ð�—®ð�—½ð�—µð�—¶ð�—»ð�—´ ð�˜„ð�—¶ð�—¹ð�—± ð�—µð�—¼ð�—¿ð�˜€ð�—²ð�˜€ ð�—®ð�—´ð�—®ð�—¶ð�—»?" Well I wasn't planning another trip until the start of Spring but it looks like I will be making another trip up to Sundre, AB a lot sooner, as in within the next couple weeks. Obviously my "Deep Freeze Wild Horse" album from late December 2017 was a big hit and I want to repeat that with another album and make it even better. The good news is that it likely will not be -40C again so I will be able to spend a lot more time out there shooting. I am looking to capture another herd this time around if possible. If the weather holds up, then I have other things in store planned as well on this same trip. And who knows maybe I can catch a sunset as nice as the one I got from last Fall.